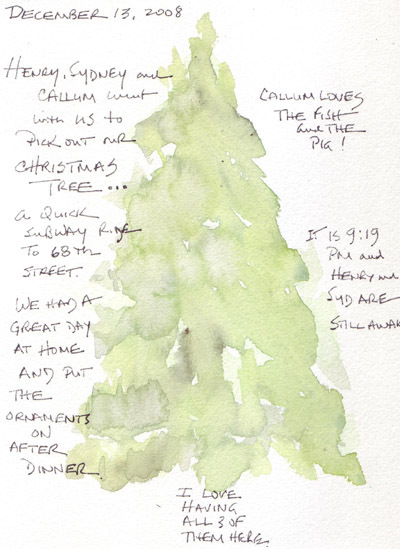 It is hard finding time to do a daily sketch over the Christmas Holidays - Unless the journal pages are fast and simple. 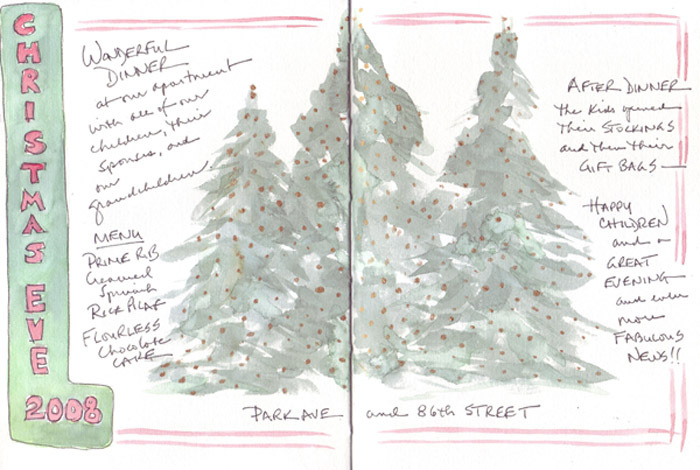 Here are beautiful Christmas trees that are put up for a month along the Avenue. 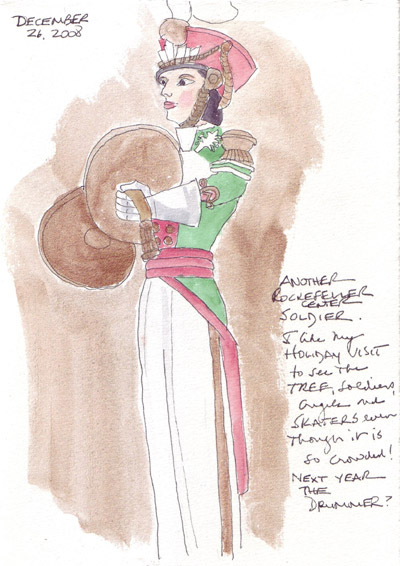 Another Toy Soldier from Rockefeller Center. I painted one last year and now should make this a tradition when I go down to see the fabulous tree. 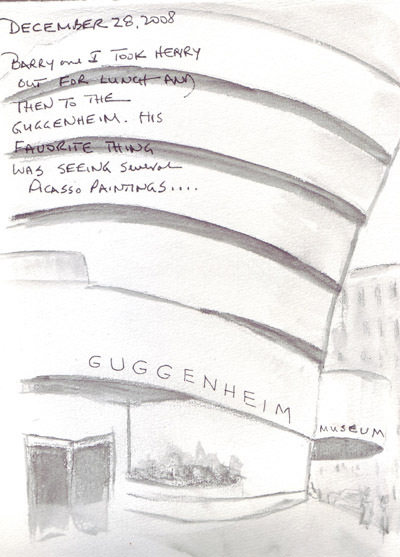 The facade of the newly renovated Guggenheim is now visible again. We took our oldest grandson for lunch and then a visit last weekend. Finally did last week's EDM Challenge. 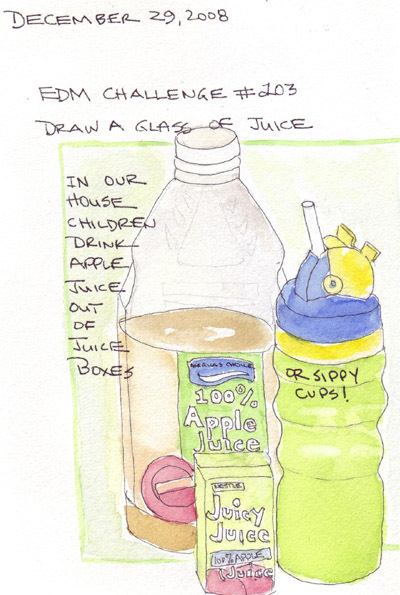 In our apartment, the children drink their apple joice from juice boxes or sippy cups. The wife of one of my professors wrote this book for her 3 small children in 1978 when she was terminally ill, to share some of her memories from her childhood in Denmark. 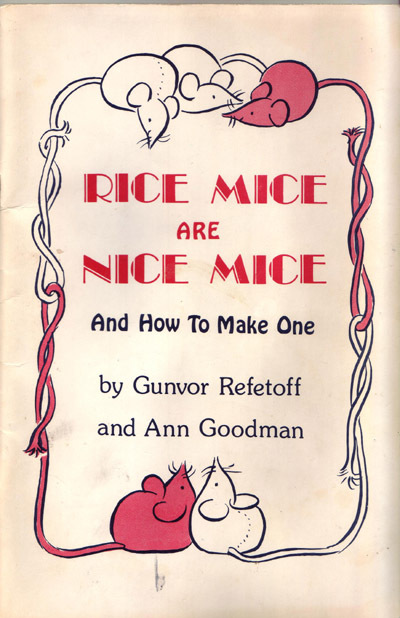 Her husband, Sam Refetoff, gave me a copy when my children were very young and I made Rice Mice for them. In the book every mouse is accompanied by a poem and my children wrote poems to capture their individual mouse's personalities. 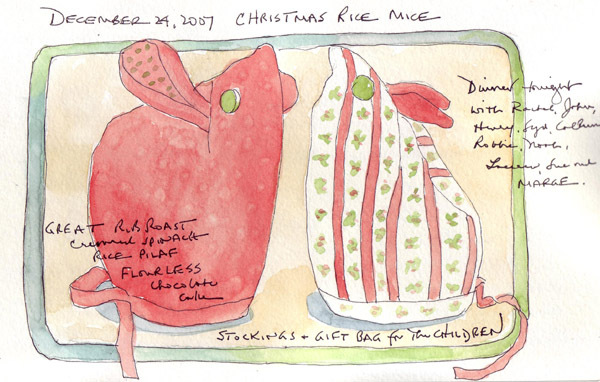 Some time during the ensuing years I made two Christmas Rice Mice and every year they are part of our table decoration. They are approximately 5 inches high and filled with standard white rice. 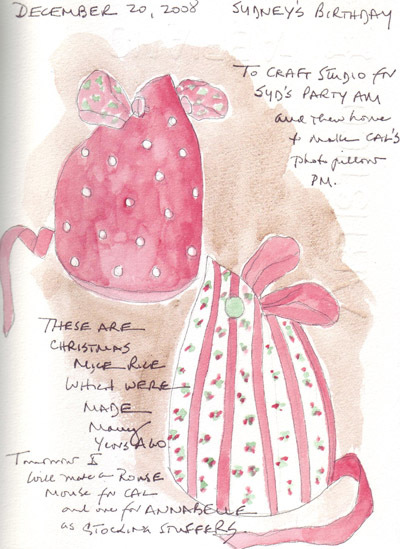 I sketched them last year for my journal page on December 24th and then again last evening. This year's painting is more accurate because I took the time to put in the polka dots! Since I didn't post the journal page last year, here are both 2007 and 2008. This year I painted a shiny gold acrylic background around the mice - wish it could be scanned and look that way! 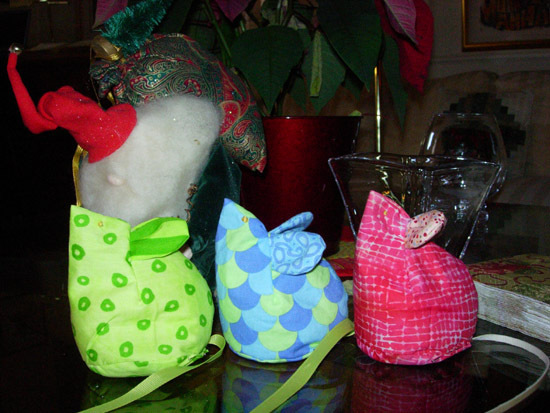 Several years ago I made Rice Mice (singular is Rouse Mouse!) 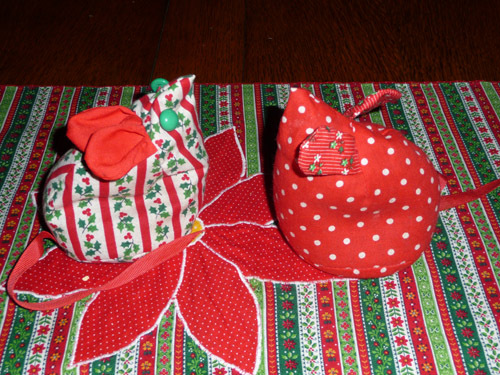 for my 3 oldest grandchildren as stocking stuffers, using scraps from quilts that I made for them. 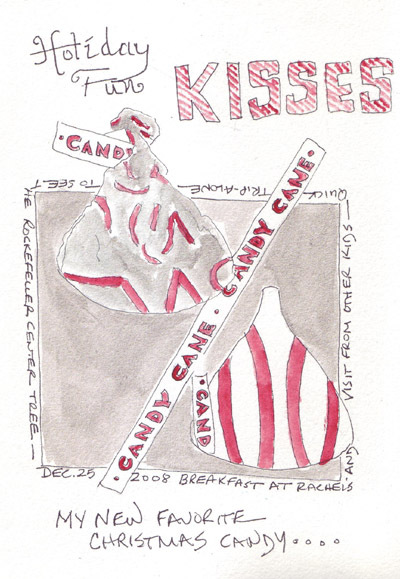 I think it might be time this morning to make one for each of the baby grandchildren for their stockings. Those for the children have embroidered eyes instead of buttons - which is not nearly as cute, but much safer! 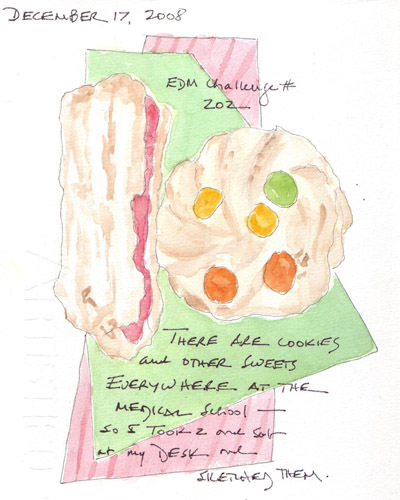 It was very easy to find cookies at work this week for the EDM Challenge. And at home I made a fresh batch of Lemon Squares for our Book Group Holiday dinner. Yum! 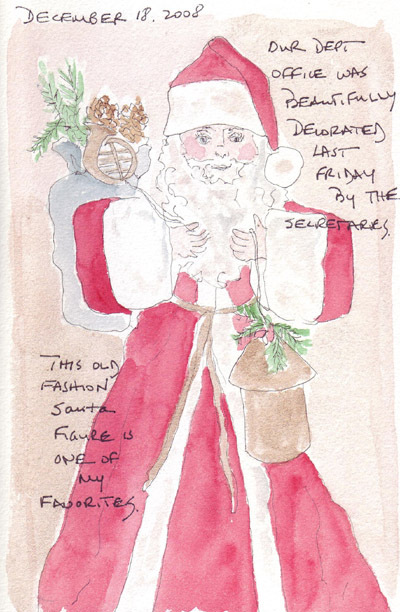 Last Firiday the secretaries decorated the Department office and it was fun trying to decide what Christmas decoration to sketch for a daily sketch yesterday since we had theater tickets and a late evening. This is a Victorian St. Nicholas figure that is not as jolly looking as our fat American Santa figures. Of course I ran out of room and he isn't as tall and thin as he should be. 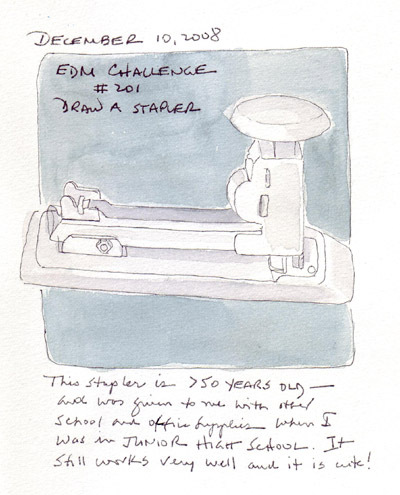 We have many staplers - and I have more in my office, but none as cute as this "antique one" which moved with me from NJ to Philadelphia, Chicago, LaJolla, San Antonio, and now New York City. Here are two of my homework pages for Danny's Illustrated Journaling Class. 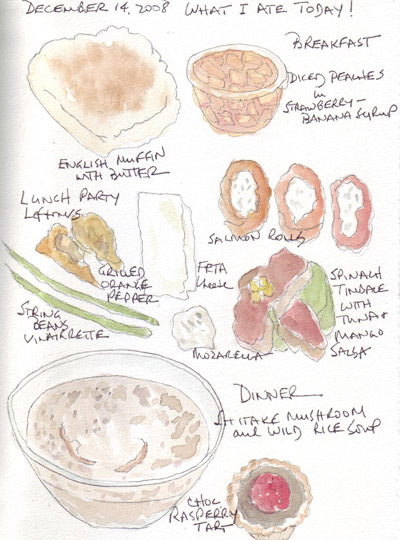 Thie first is just a painting with writing, the second is a specific assignment to draw what I ate today. 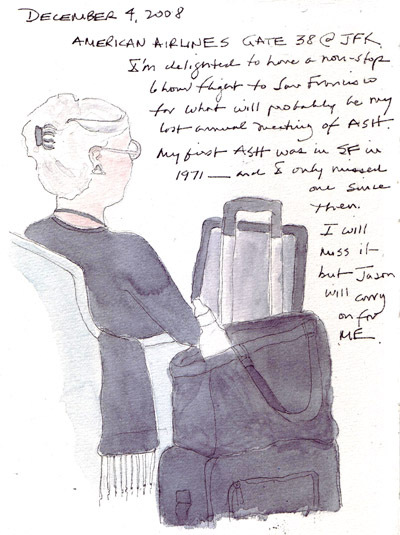 I was in San Francisco for several days at a meeting and wanted to upload select recent journal pages from the last week. This passenger, in the departure lounge with me at JFK, worked on her laptop right up until boarding. I took an early morning walk from the Moscone Convention Center area to Union Square and then Chinatown. 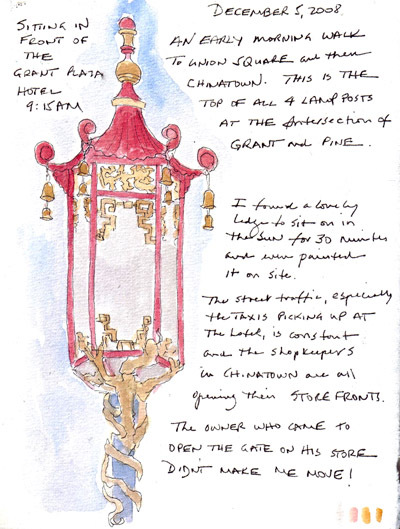 It was beautiful sitting in the sun sketching the lamp post tops at the intersection of Grant and Pine while watching the area wake up. 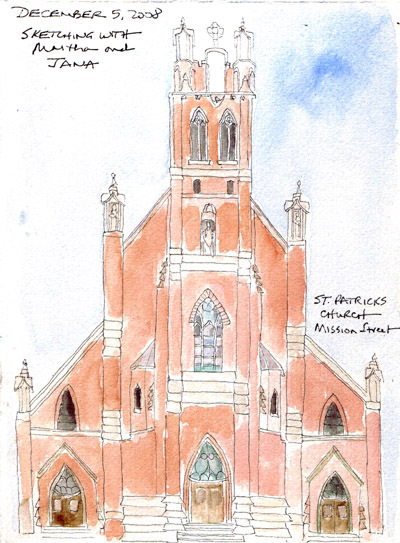 Friday afternoon I met Jana and Martha (fellow EDM members) and we talked and simultaneously sketched St. Patricks church on Mission Street and then warmed up and exchanged our sketch books over a glass of wine in The View Lounge on the 39th floor of the Marriott. Jana already posted a photo of us, our sketchbook pages, and the lovely view we enjoyed. 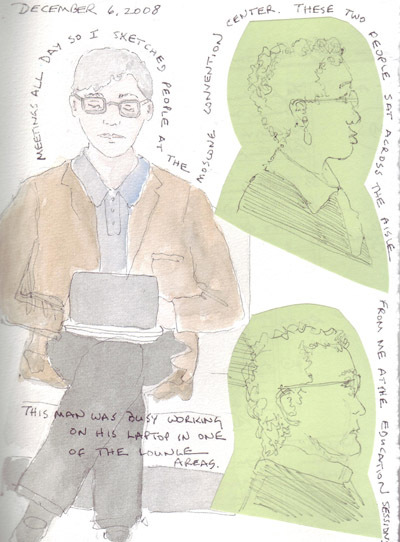 During my meeting I sketched my neighbors across the aisle or in the lounge, trying to remain inconspicuous and to pay attention to the lectures. I was afraid that I wouldn't have time to do my homework for Danny Gregory's Illustrated Journaling class while I was gone, but I did get one exercise done - drawing through a doorway. 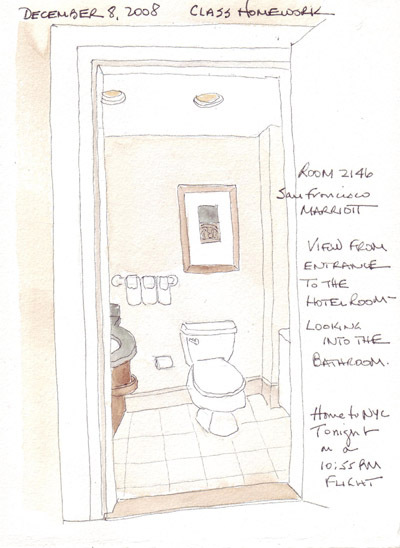 This was the bathroom from the hotel room entrance of my room at the Marriott. In order to get back to New York City for our 5th class, I took the "red eye" home from San Francisco. At class the next evening, Danny brought fruit so we could create a journal page documenting "a transformation" while we were eating our piece of fruit. He really wanted us to mix our drawings with words that reflected the experience on the journal page. 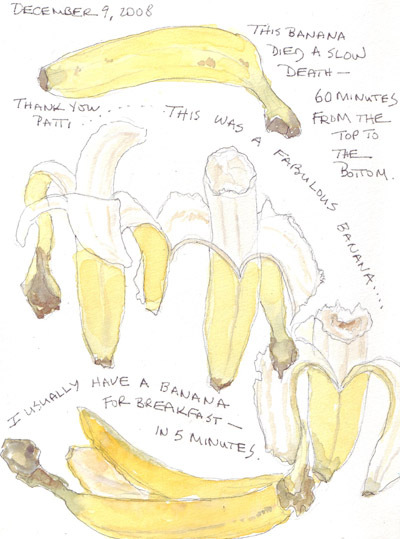 This was a fun exercise - and similar to many apple eating pages in Danny's journals.